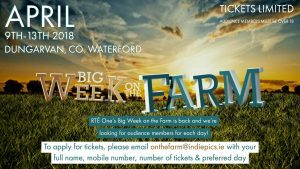 RTE One’s Big Week on the Farm is coming to the South East next week and the team behind it are looking to fill the final few spaces in the live audience for each day. Beginning on Monday and concluding Friday, the event takes place in Dungarvan and people can apply for tickets by emailing [email protected] with their full name, mobile number, their preferred day and the number of tickets they’re looking for. Audience members must be over 18.